Exciting news for reality TV fans. 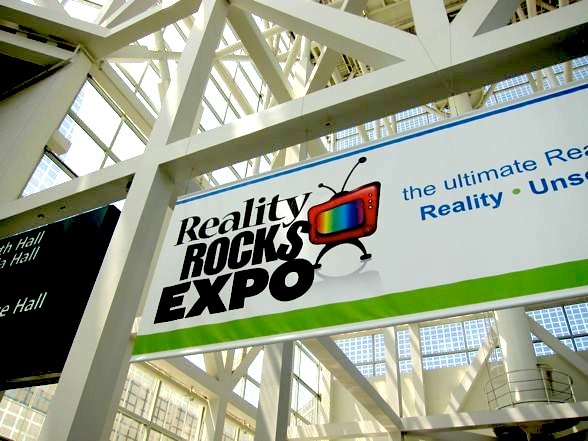 This past weekend, Los Angeles played host to the first ever Reality Rocks Expo, an event that brought reality stars, reality fans, and reality producers together for one big reality bonanza of epic proportions. The convention took place on Saturday and Sunday, and while I didn’t get a chance to make it over on the first day (when apparently all the “big” stars were present), I did meander down to the Los Angeles Convention Center on Sunday to check out the scene. At long last, the twelfth season of Big Brother came to a close last night, ending one of the most lackluster installments in the franchise’s history. The good news was that despite this group’s generally blasÃ© approach toward the game, the finale proved to be very entertaining and even had a few nail biting moments. Not a bad way to finish out an otherwise forgettable group. Well done, Kristen! Well done. Thanks B-Side Blog reader Shiney for the heads up. With the new champion of Big Brother about to be crowned on Wednesday, CBS took a look back on Sunday at the season it was… and what a season it wasn’t. The hour featured all the usual clip show fodder — arguments, high jinks, canoodling — but it also served as an unfortunate reminder of how dull this season was. Sure, there were some flare ups, but they were few and far between. In fact, there’s been so little drama that CBS could only really muster up about two minutes of new, unseen footage. Pretty much anything worth showing has already been aired, as opposed to previous seasons whose episodes were so chock-full of craziness that many valuable gems never made it to air until the clip show. Alas. I suppose we’re due a dud season every once in a whiel. However, I’ll refrain from being too much more of a hater and just set my sights on next season. It’s now official. There’s no more drama left in Big Brother 12, and despite their best efforts (READ: the Saboteur), the producers can’t even drum up any sparks if they even try. So what else is there to do? Well, from the looks of Wednesday’s episode, the Big Brother brass tossed their hands up in the air and resigned themselves to silly high jinks at the mercy of the house guests. And guess what? It worked! Wednesday’s episode had only a smattering of drama, but that was okay because the rest of the hour played out as a goofy exercise in surreal television. 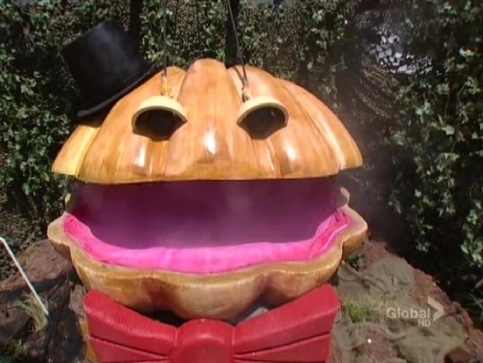 Not only did we get a bizarre yet totally inspired giant clam with a penchant for showtunes, but we had a deliriously funny sock puppet sequence that lasted many minutes on end, followed by spontaneous dance parties, all held at the whim of Big Brother. Here’s the deal. The Veto ceremony brought us the annual resurrection of Otev, the strange monster that always requires sacrifices in the form of former houseguests’ dolls (or in the case of Wednesday night, CDs). I could try to explain it further, but all you really have to know is that in a departure from the tiki monsters of the past, this year, the producers reimagined Otev as a giant clam. Look, I’m bound to laugh anytime anyone says the word “clam,” but when Big Brother contestants are forced to say it over and over again, well, let’s just say that’s what I call a good time. Making matters even more crazy was the added character detail that Otev happened to simply ADORE Broadway showtunes — so much so that he sang them nonstop (and even came adorned with a fey little top hat, cane, and bowtie combo). I’m not sure who was smoking what to bring about this incarnation of Otev, but it was clear that this person had a fantastic time with the idea. I now have a difficult task in front of me. I have to recap an hour of Big Brother where very little happened. Sure, we got a new HOH, and sure, we have new nominees, but besides that, we got nothing going on in the BB house. That’s thanks to a final five which is entirely too chummy. Not only that, we have no heroes or villains. I guess Ragan is sort of a villain, but he’s also the underdog, and we all love underdogs. Lane has emerged as my favorite player, but a Lane victory has about as much drama as watching a gentle breeze urge a cotton ball along table (don’t get me wrong, that can be very dramatic, especially if scored by Philip Glass, but I think you know what I’m talking about). That being said, there were some high points to this episode. I enjoyed the HOH competition quite a bit. Even though I already knew the outcome, the way it played out was quite nail-biting. Second, I enjoyed the silliness of Pandora’s Box. Let’s face it: nothing else is going on with these players, why not spend the time screwing with them. That’s exactly what the producers did. After new HOH (spoiler, if you haven’t seen it yet) Lane opened Pandora’s box and collected a whopping $91.17 in prizes from a money tree, the house had to endure three punishments. The first one we saw was the disappearance of cups and silverware for the week. It was a petty prank, but an effective one nonetheless. Color me crazy, but I’m more excited to see the next punishments than the outcome of this week. 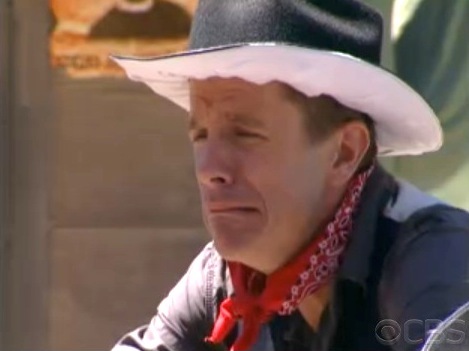 BIG BROTHER PHOTOCAP: Double The Eviction, Half The Drama! Well, it was the annual “Fast Forward” edition of Big Brother last night, which crammed one week of gameplay into a single, scant hour. I always enjoy these episodes, even if it means that at least one person gets something of a raw deal. Last night’s was no different; however, while the competitions were fun to watch, the outcomes proved to be as predictable as ever. Just goes to show that even during a week of impressive (for this cast) strategizing, we can’t always expect true fireworks. Fun times on last night’s Big Brother. The episode had a lovely mix of real strategizing and goofy antics, thanks in part to the veto challenge, which appealed to various players’ greedy impulses. The conceit was one we’d seen before: house guests could either vie for the Veto or minimize their chances by opting for prizes. It’s become a classic Big Brother dilemma, one that I believe was first used during the All-Star season. Back then, Danielle was annoyed because her alleged allies grabbed all the goodies instead of focusing on stealing the Veto away from whoever it was she was targeting. Since then, the pattern has more or less remained the same as evidenced by Britney’s failed attempt to keep her nominations the same. Rather than stymie Brendon’s ability to gain points that would earn him safety, Brit’s alleged allies of Lane and Hayden spent their time culling trips to Hawaii and phone calls home. Why? Because they didn’t care if Brendon got the Veto. In fact, they wanted him to come off the block. That’s right, the Brigade had bigger (metaphorically) fish to fry: Matt. With Kathy gone from the Big Brother house, the game has all but eradicated its “floater” players, which means that the war is on! Well, as “on” as this season can be. Yes, we have the Brigade vs. Team Ragan, and so far, tensions are… slightly elevated. For the first time all season, we’re seeing some true intrigue as the likes of Enzo, Hayden, and Lane try to cut Matt from their ranks, but of course this was all handled calmly and without much drama. The guys quietly murmured about Matt’s murky loyalties, and eventually made their case to Britney for putting him up as a pawn against Brendon. As for Matt, he did his usual thing: he smiled and giggled his way through various lies, ultimately throwing Enzo under the bus to Britney. I gotta admit that for the first time all season, I’m actually rooting for The Brigade. What’s this? I’m rooting for someone? And most importantly, I’m rooting against someone else? Oh, glorious Big Brother! We finally have some signs of life!